In response to a Luttgen family request, this week I have been profiling William Luttgen, who participated in four Vanderbilt Cup Races as a driver and mechanician. Prior posts included his initial success as a driver (1904), his dramatic experince as a mechanician (1905) and his return as a driver (1906). Today, we conclude the profile describing Luttgen's best ride in the memorable 1908 Vanderbilt Cup Race. 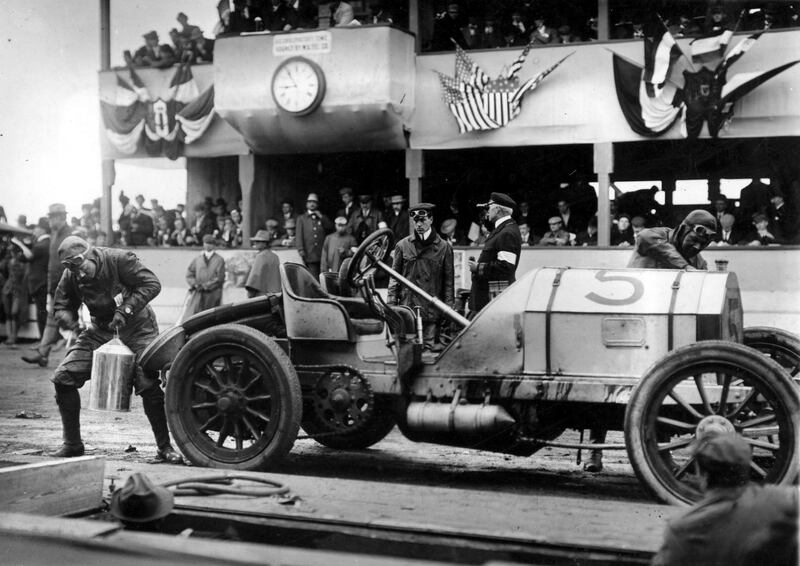 In September 1908 William K. Vanderbilt, Jr. decided to enter his Mercedes in the Vanderbilt Cup Race. As in 1906,Vanderbilt decided not to be a driver but to continue as the race referee. He then selected William Luttgen to drive his car based on Luttgen's extensive Mercedes experience. 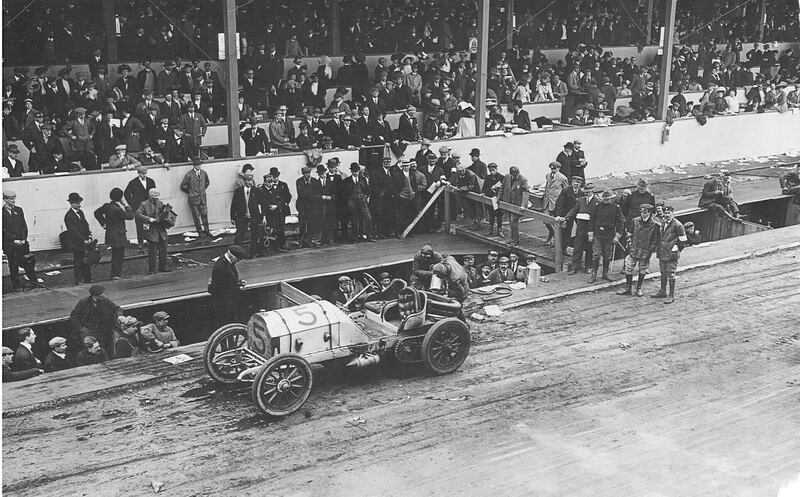 In this photo, Luttgen and his mechanician are refueling their #5 Mercedes in front of the Hempstead Plains grandstand and service "pits". Note William K. Vanderbilt Jr.standing behind the car carefully observing his car. At the end of lap nine, Luttgen was running strongly in fourth place. Beginning the next to last lap, he stopped at the pit for refueling and a change of the right rear tire. Luttgen and his mechanician reportedly quickly refreshed themselves with a bottle of wine and then jumped back into the heat of the battle. 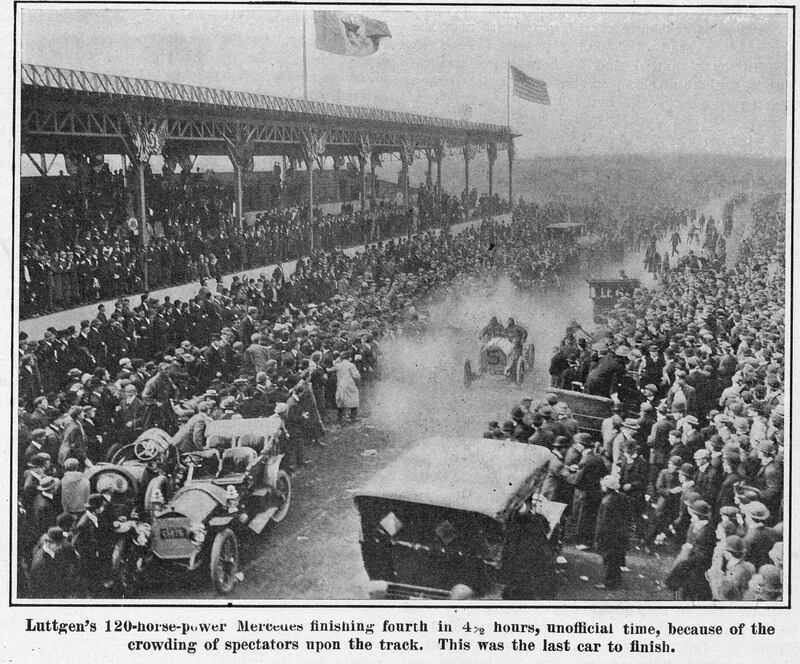 In typical Vanderbilt Cup Race fashion, the crowd swarmed the track almost immediately after the first two cars finished. The Race Commission had previously notified the teams they did not intend to call the race until five competitors had finished. It was not to be. The race was officially called off and telephone calls went out to signalmen to display white danger flags to waive off the remaining nine cars still running. Soon after, William Luttgen, still in fourth place, barged through the crowd at what observers judged to be tremendous speed. One newspaper called it “a mystery” that he made his way through the throng with no contact more severe than scraping a few shins in the crowd with his wheel hubs. 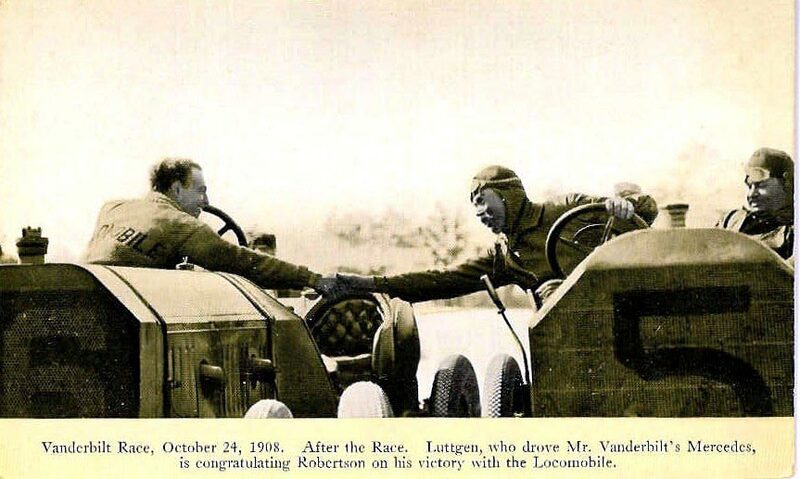 In this postcard image, William Luttgen can be seen congratulating George Robertson, the first Amercian to win the Vanderbilt Cup Race in an American car. Luttgen was given fourth place in the race , averaging 57.8 miles per hour over the 11 laps. November 9, 2009 Update: Lisa Conley and Sandy Lillydahl, William Luttgen's granddaughters, have provided the following information and two wonderful vintage photos from their family archives. 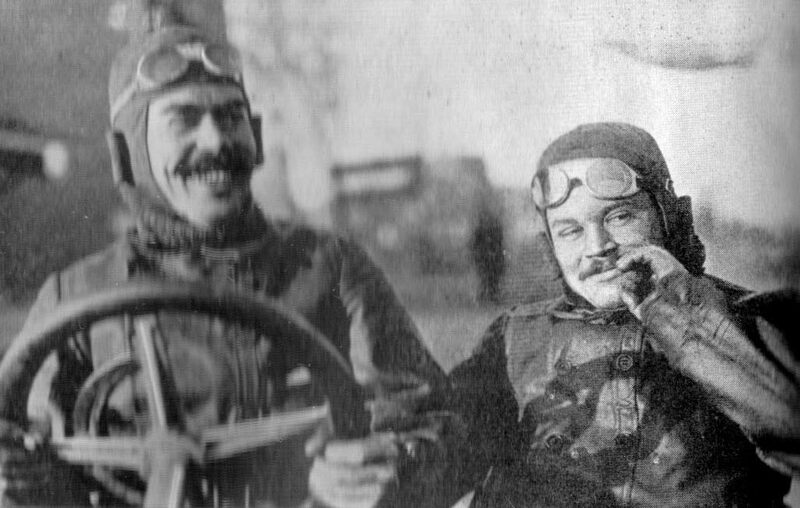 Soon after the 1908 race, William met Lillie Schweiter on a ship crossing the Atlantic. Lille was one of the first European-descent children born in Kansas- the daughter of Swiss-born Henry Schweiter. 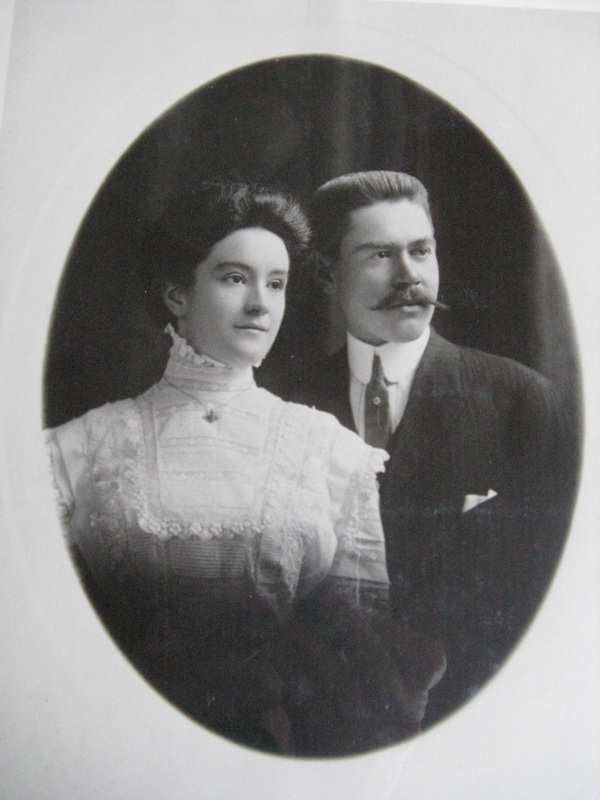 In June 1909, William married Lilie with the condition that "he give up the dangerous sport of racing". They lived in the Germantown/Yorktown section of Manhattan where he ran one of the first Mercedes dealerships in the United States. A little later, they moved to Elmhurst, Queens on Long Island. Later, the family moved to Wichita, Kansas where Lillie's family lived. As his granddaughter remembers; "When Grandpa taught his daughter Helen (our mother) to drive in Kansas, he took her to a back road in Wichita and put her behind the wheel. Then he said "Okay Helen, let's see how fast you can go!" According to the magazine Antique Automobile, when William Luttgen died at the age of 88 in 1965, he was “the last living participant in the first Vanderbilt Cup Race”. Lillie "lived to be over 100, and had stories about sod houses, log cabins, buffaloes, Indians and living on the Chisholm Trail." Thank you Luttgen family for providing details on your remarkable grandfather! I didn’t know these videos existed of the Vanderbilt Cup Races. What a treasure to have for our family. I am the youngest of 5 children of Jacob & Lillie Wagner. 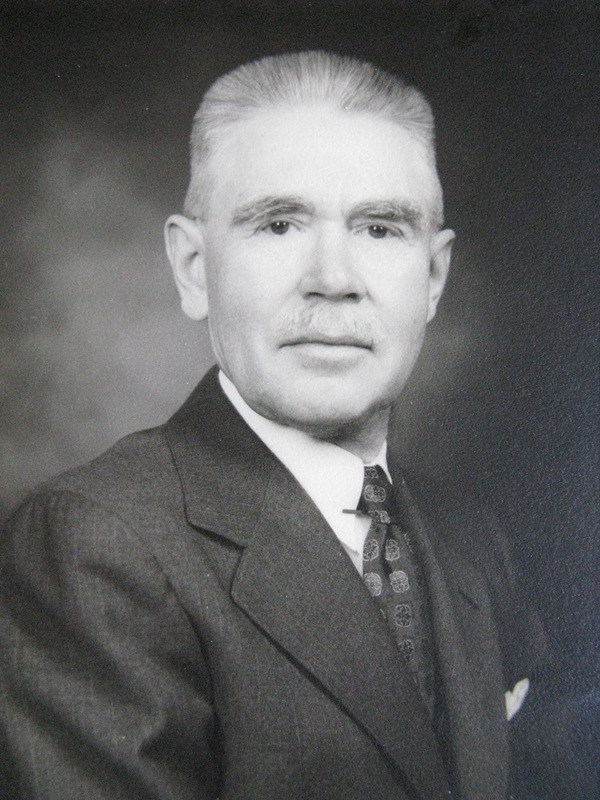 William Luttgen was my grandfather. Both my parents are deceased but they would have been so impressed with these videos. Thank you for the incredible research you have done and the wonderful memories you have created for generations to come. I am married to Carolin Kelley (Wagner) who is also a grandaughter of William Luttgen. If there is any way to get copies of the movie files I would love to get them and pay whatever the cost is. We are attending a Wagner family meeting in Seattle this month where I would love to show some of these pictures.